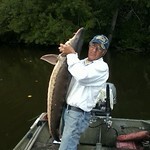 Sturgeon can be characterized by having an arched back with one row of bony plates or scutes. Their head is down sloped. The bottom of their snout has four barbels or whiskers. Their mouth is located on the underside of their head. These fish are brownish olive in color on top, grading to pinkish tan on their sides, to white on bottom. Atlantic sturgeon are found along the Atlantic coast from Labrador, Canada to Florida and west to the Mississippi delta. Before the turn of the century, most major river systems from Canada to Florida contained abundant, healthy stocks of Atlantic sturgeon. During the 18th and 19th centuries, the Chesapeake Bay supported the second greatest caviar fishery in the United States. However, by the end of the 19th century, high harvest rates drastically reduced abundances of Chesapeake Bay sturgeon. Mature males are approximately 5 feet and 90 pounds. Adult Atlantic sturgeon are anadromous fish that spend the majority of their life at sea and only enter freshwater in the spring to spawn. Atlantic sturgeon are slow-growing and late maturing anadromous fish that migrate from the ocean into the coastal estuaries and rivers to spawn. Atlantic sturgeon will ascend tributaries to spawn in tidal freshwater in May or June when temperatures reach approximately 64oF. Males mature in 10-20 years when they are approximately 5 feet and 90 pounds. Females mature in 15-30 years at 6 feet and 160 pounds. Females spawn only once in a 2-6 year period, so recruitment is very low even though individual females produce up to 2 million eggs. These large, black eggs are broadcast into the water, fertilized by males, and sink to the bottom, attaching to substrate. Juveniles will spend several years (1-6) in freshwater of some large rivers or they may move down into more brackish waters near the river mouth before becoming migratory. As sub-adults, they will then move into coastal and continental waters where they grow and mature. Little information exists concerning the movements of Atlantic sturgeon once they reach the ocean. Sturgeons are members of the ancient family, Acipenseridae, and have been here on earth since the Cretaceous period more than 120 million years ago. The species name of Atlantic sturgeon "oxyrhinchus" means "sharp snout". Early settlers reported huge schools leaping from the Susquehanna and James, and referred to sturgeon as navigational hazards. An American officer during the Revolution had his leg broken by a ten foot sturgeon that leaped into his boat as he rowed across the Potomac at Georgetown. The oldest Atlantic sturgeon was captured from the St. Lawrence River and was aged to be 60 years old. ​For more information on Atlantic sturgeon and their management, please contact Chuck Stence or call Chuck at 410-643-6788 x2114.